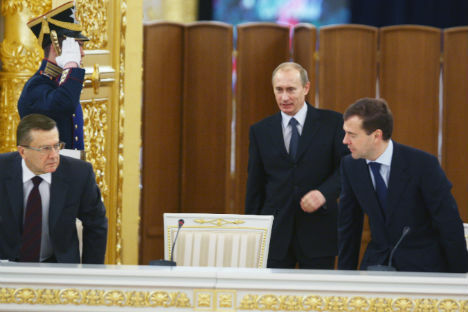 Can PM Medvedev walk the talk? Russians will be closely watching how Medvedev spurs political reforms and satisfies their hunger for a more democratic system. Barely five days before leaving office, Russian President Dmitry Medvedev finalised two key political reforms that he had promised after massive anti-government protests swept the country last December. Medvedev recently signed the laws introducing gubernatorial elections and lowering barriers for running in parliamentary and presidential elections. Medvedev said the amendments, which sailed through both houses of parliament in mid-April, should “raise the level of political culture”, but critics say they were watered down by the ruling United Russia. The bill on gubernatorial elections stipulates that candidates need the support of at least 5% of a region's municipal deputies and requires non-party candidates to additionally collect signatures of at least 0.5% of the local population. It also calls on political parties to consult the president before nominating candidates and requires a court ruling to hold a referendum on removing a governor. Gubernatorial terms are limited to two consecutive five-year terms. The second bill says parties no longer have to collect signatures to take part in parliamentary elections. For presidential elections, it lowers the number of signatures required from two million to 100,000 — or 300,000 for independent candidates. A third bill, which reduces the minimum membership from 40,000 to 500 for political parties, was signed by Medvedev last month. The first gubernatorial elections will be held on October 14 in those regions whose governor's term expires between June 1 and Dec. 31 of this year, the Kremlin said. Medvedev has fired nine unpopular governors in recent weeks, leading to allegations that the Kremlin is unfairly maximising the chances of its candidates. Medvedev, who has replaced more than half of the country's 83 regional bosses during his four years in office, said that most governors' voluntary resignations came after pressure from him because of suspected corrupt activities. Analysts said opposition candidates are unlikely to win gubernatorial posts this year. Pavel Salin, an expert at the Center for Current Politics, said the approval by municipal lawmakers presents a formidable hurdle to outsiders. “The ruling elite could not freeze the process, but managed to slow it down,” he said. One more important move championed by Medvedev himself - the creation of a nationwide public television channel free of government interference - is yet to take off. During his last days in office. he also offered symbolic gestures like pardoning a wrongly-imprisoned man and taking part in a tough question-and-answer broadcast. Experts say there’s little that can save Medvedev from an inevitable reputation that will follow him out of the Kremlin. Yet each of these ostensible Kremlin concessions has elicited scorn from one section or another of the nascent anti-government movement. Critics have slammed the return of gubernatorial elections because of the “presidential filter” they incorporate, foreshadowing the continuing meddling of the executive in regional affairs. Many promienent non-systemic opposition figures also seem turned off by the prospect of political competition in what they say is a new party registration system rigged to splinter the anti-Kremlin movement. Lastly, few believe that public access television is realistic in a country where virtually every editorial line is dictated by private interests.